Andy Martin — Laguna Beach Live! Laguna Beach Live! 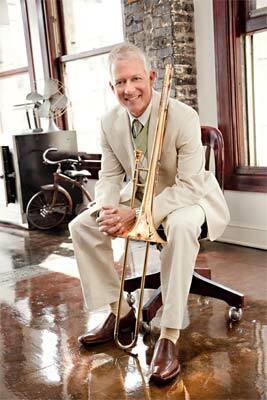 is pleased to present trombonist Andy Martin and his Quintet on July 8 in Jazz Wednesdays series. Jazz Wednesdays are in the beautiful outdoor Rose Garden of the Hotel Laguna, 425 So. Coast Hwy., Laguna Beach, 6:00 to 8:00 pm. Cover charge is $10 and an outstanding selection of drinks and food is available for purchase. Doors open at 5:15 PM; reservations for groups of 8 or more by calling 949-715-9713. For more information, visit www.lagunabeachlive.org. A world-class jazz musician, Andy has already released eight albums as either leader, or co-leader. These albums showcase his dazzling improvisation alongside other top jazz artists such as the late Carl Fontana, Pete Christlieb, Bobby Shew, and Eric Marienthal. Andy leads a quartet on his latest record project, which is soon to be released on the Fresh Sounds label. He has also collaborated as a sideman with jazz greats such as Stanley Turrentine and Horace Silver. Andy has a long association with Vic Lewis and has been the featured soloist on Vic’s cds for the last 17 years. Vic was instrumental in getting Andy and The Metropole Orchestra together for the marvelous recording on Mons Records.